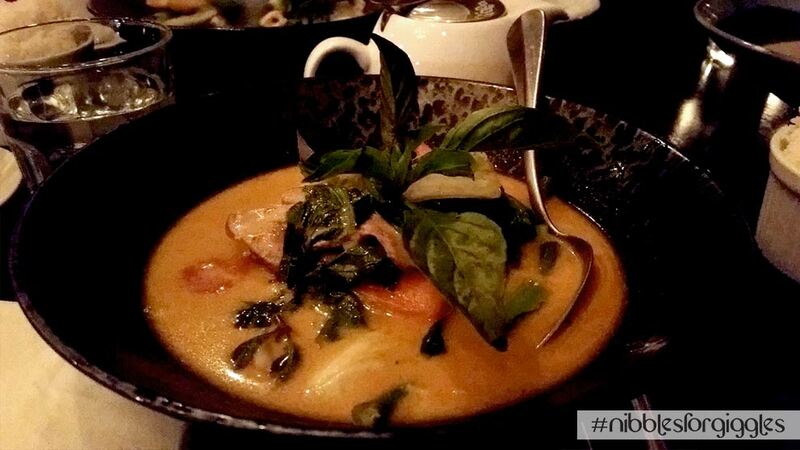 A quaint restaurant on Melbourne’s Chapel Street that gives Thai cuisine a modern twist – the right way! Ayatana is a charming little restaurant and wine bar, on the Windsor end of Chapel Street, that serves contemporary Thai cuisine. What strikes you when first enter is the intimate size of the restaurant and the impressive number of wine bottles lined up against the walls. Its modern, elegant decor gives you the immediate impression that this place offers more than just your standard Thai dishes. As it was a weeknight, we didn’t expect it to be too busy. However, as we walked in there were already a few tables filled out, which is always a great indicator for such a small sized restaurant. This also meant that there was a good amount of chatter around combined with the sounds of cutlery clattering against plates. Together with the warm lighting and smell of freshly made Thai food wafting into our nostrils, the setting was ideal. The 2 waitresses on shift were extremely pleasant from the moment we walked in. They helped us when we ordered entrées. 2 out of the 3 entrées only consisted of 2 pieces, as we were out dining with a special guest, we asked the waitress if we could have 3 servings instead of the 2 which they were happy to accommodate which definitely made it easier for us to dine. The waitresses kept an eye on table to ensure food came out in a timely manner, with the starters being brought out one at a time and being cleared before the next plate was served. Each dish brought out was always fresh and hot. The first dish to be served was the spring rolls…and they were definitely good spring rolls! Fresh tasting, nice and crispy on the outside with a pleasing amount of filling on the inside. Along with the sweet-chili dip accompanying it, this was a strong start – so far, we were happy nibblers. The fish cake sliders were next and this is where the ‘contemporary’ theme started to appear. This was a very messy dish but we all like a bit of finger licking messiness every now and then, so that wasn’t an issue at all! The fish cakes were juicy and you got two in each slider which made it abnormally,possibly awkwardly, tall. This caused the problem of one fish cake trying to escape the bun as we took our first bites! The caramelised vinegar provided that bit of sweetness fish cakes need and it all went together well – a great fusion dish. The tacos were an interesting combination. There was a comfortable kick of spiciness (suitable for the chili sensitive) to the pulled beef and the sauce made the filling flavoursome and oozy. Perhaps the tortilla could have been grilled slightly so it was warm and toasted on the outside to give a contrasting crunchy texture to the soft, lush filling. It would add something else to this dish but overall the entrées provided a solid stepping stone before the main meal. The mains all arrived in together, which worked great especially in a group setting. As for the standout dish on first glance it was definitely the soft shell crab and prawn green curry. The prawns were exquisitely cooked – they had butterflied under cooking, perfectly, and were beautiful. The look of a freshly cooked butterflied prawn gets the taste buds going immediately. The soft shell crab was also very crumbly and drool worthy but the underlying element to any curry is – of course – the sauce. And the green curry sauce stood its ground, it was spot on. A coconut creaminess, a sweet edge and a bit of a kick from the chili meant both the crab and chicken dishes were delicious to get a spoon and start eating the sauce as if it were a soup! So so moreish. Our special guest had the chicken green curry, no complaints there whatsoever – a happy nibbler (or in this case, food inhaler) leaves an empty plate with a satisfied stomach. At this point we must add that we at #nibblesforgiggles have been tasked to find big portions of food for the big eaters out there. In this category, Ayatana’s mains do not disappoint. There are lots of meat and vegetables in these dishes and they load up on the sauce too, which is a great thing because they make some damn good sauces…So for the big eaters, this is one for you too! The one unfortunate downside was the duck curry. The red curry sauce was delicious and moreish just as the green curries on the table, but the duck meat left a lot to be desired – it wasn’t very tender and was overcooked, making it a bit of a chore to chew. This was a shame as duck is a very good meat to eat with a Thai red curry sauce but with this small mistake, it was a let down. It was a shame the duck wasn’t as it should have been, but this is something that can be quite easily fixed. The food is nice and the portions generous, if you want to steer away from the standard pad Thai dish in a run of the mill Thai restaurant, we would certainly recommend Ayatana. Thanks for having us!